The annual ride, now in its fourth year, has literally experienced exponential growth, beginning with a modest 60 riders four years ago and doubling every year since. 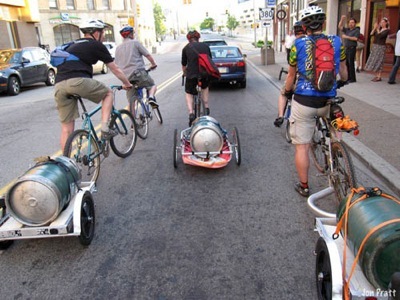 Organized by the East End Brewing Company and BikePGH, the idea of the ride is to deliver the first batch of the seasonal ale by bike. This year’s ride was part of the Bike to (and from) Work Day events. That’s one massive beer ride. Hat tip to evanoneil.